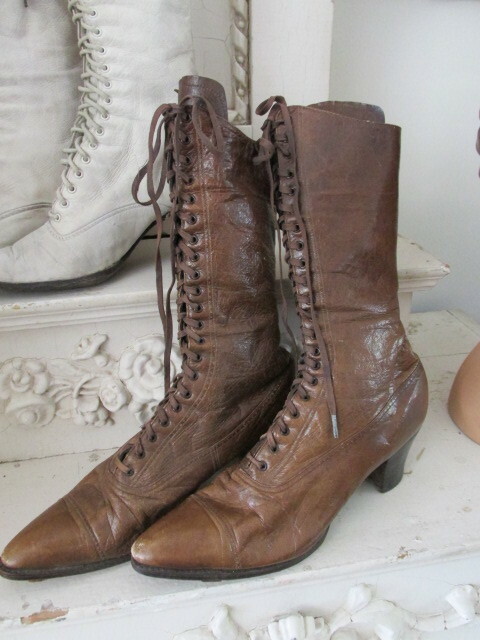 HESE ARE A PAIR OF GORGEOUS OLD ANTIQUE WOMAN'S SUNDAY CHURCH, GARDEN PARTY OR SPECIAL OCCASION SHOES OR BOOTS IN BROWN. The old vintage boots are becoming so popular. You see these in lots of the French books and the Jeanne d' Arch Living style for display in homes. They are leather lace up boots with heels and pointed toes. There are 21 rows of the lace thru holes with metal rings on each boot. There is wear, as I show, a few minor stains, with scratches or scrapes as I show. They are very slender shoes and have a wonderful French look to them! These would be wonderful in a display cabinet or on a dresser or vanity. Perfect anywhere in your home in your shabby chic, French country, Paris Apt or romantic cottage decor. Measurements are about 12" tall and are about 10 1/2" from heel to toe. The heel is about 2 1/4" tall at the back. They are slender with the width at the widest point about 3" wide at the bottom.